Today, I’m excited to talk about a health threat we don’t often think about: indoor air pollution. Meet Peter Spiegel. He is a serial product inventor who has founded numerous successful companies related to direct response advertising, marketing and consumer products. Mr. Spiegel is considered by his peers to be one of the definitive experts in the direct response television advertising (DRTV) and infomercials. A top marketing, financial, product development and operations strategist, he has been active in the industry for more than 25 years, developing a wealth of experience and success that spans all product categories and all channels of distribution including DRTV, retail, catalog, print and internet. An interesting fact about Peter is that he grew up in a standard American diet family. His father had three heart attacks in his 20’s and 30’s and died young. He was raised eating lots of meat and white bread but he went vegetarian when he was 19. He has been a vegetarian for over 40 years. He is more recently known for his invention that has finally solved this major problem with our health we’re all facing – indoor air pollution. Get your Air Doctor air purifier 50% off: HERE! Robyn: Hey, everyone and welcome back to Your High-Vibration Life. I could not be more excited about today’s topic. We are talking about indoor air pollution, and if that doesn’t sound interesting to you, you are gonna learn some things today that are really gonna blow your mind. I’ve invited one of the busiest guys I’ve ever met, hard to chase him down, Peter Spiegel, who runs five companies. He’s a serial product inventor. Interesting fact, he grew up in a standard American diet family, his father had three heart attacks in his 20s and 30s, died young. He was raised eating lots of meat and white bread, and he went vegetarian when he was 19. 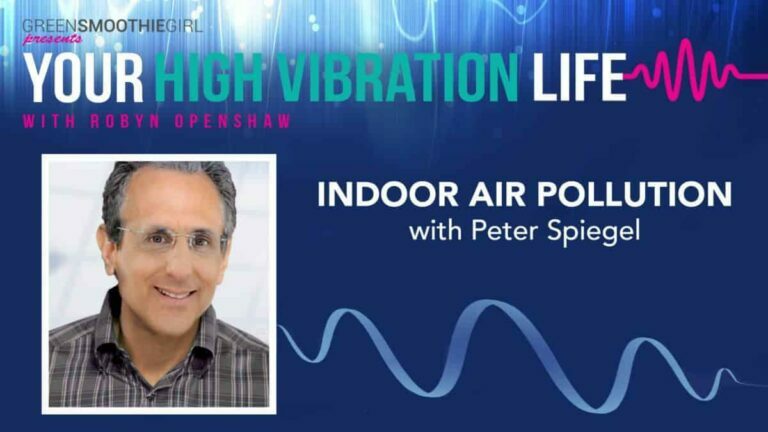 He has been a vegetarian for over 40 years, so he’s walking the talk, he’s a life-long Yogi and meditator, but professionally, he has invented what has finally solved this major problem with our health we’re all facing – a lot of indoor air pollution. You’re gonna hear some statistics that are gonna blow your mind if you think that air pollution is what you breathe when you’re outside. I’m really excited to introduce you to Peter Spiegel. Welcome. Peter: Thank you so much, Robyn. I’m very glad to be here with you. Robyn: Yeah, so you’re an expert on air quality, and I know you have some really great facts from World Health Organization and major publications. Tell us a little bit about why we should care about air quality. Peter: Sure. Everybody’s probably aware that air is essential to our lives, and every day we inhale and exhale 11,000 liters of air, and while humans can survive for a few days without water, longer without food, without air we can only last a few minutes, and the air that we breathe, it circulates through our entire body. It impacts all the cellular functioning of our body, all our internal organs: our heart, our lungs, our kidneys, and our liver, and when we don’t breathe pure air, then we’re introducing toxins into every cell of our body. If we’re trying to live a clean, balanced life, making sure that the air that we breathe is clean, is one of the most important things that we can do. Robyn: You know, my listeners might be thinking, “Why is she so excited to talk about indoor air pollution?” Here’s why: I keep … Every few years I go study the subject and I have been trying to figure out what to do about it in my own home. There was nothing that I really wanted to buy, it was really expensive, I didn’t believe that it would remove chemical pollution, but the reason I’m so excited about it is, I live in Utah Valley, and we have some of the worst air quality in the world. There are sometimes days of our winter where our air quality is worse than in China where there is no environmental controls. Living here in the Mountain Valley, and you might think, “Why do you live there?” Well, I’m moving. I’m moving to a higher elevation in Park City, Utah, next year when my youngest son graduates high school. But, I really love the fix for this problem that you’ve discovered that I have finally been willing to go out there and talk about, to spend money on, to get one for each of my children for Christmas, because it’s cost-effective, and because it actually works. That’s why I’m bringing you to my listeners, is after studying it for years and years, and being really frustrated with the solutions that were out there, I want to go to indoor air pollution, because, I, … For years and years I was afraid to go outside, still am. Couple weeks ago we had 850%, the PM 2.5 or particulate matter under 2.5 microns. I know you know what that is, but just in case someone doesn’t, which is those tiny, tiny particles that don’t … they get in our airways and they don’t leave our airways easily, and they do some pretty deadly damage and we had 850%, the upper limit of the federal standard. They cancel recess for the kids, they tell people not to drive if they don’t have to, they tell the joggers to stay inside. Huge risk for cancer, pulmonary issues, cardiovascular issues. Talk about the indoor air quality versus outdoor. Peter: Yeah, I think … Thank you for bringing that up, talking about outdoor air quality and indoor air quality. In some ways, before you can understand indoor air quality you have to start with understanding your outdoor air quality. Even in people who keep their doors and windows closed … if you have central heating and central air-conditioning you’re still recirculating about 30% … you’re bringing in about 30% fresh air … constantly along with the recycled air. If the air is bad outside of your home, the air is gonna be bad inside of your home. We know ourselves … We live in Southern California, recently within the last month we were fortunately a distance … nine or 10 miles from the closest fire, but we were surrounded on the west, north, and south, by these wildfires. We have an air purifier in our home, we have several since we make them, and there’s an air sensor on our air purifiers that are actually counting these small particles that you were talking to, the PM 2.5 particles, and measuring them in real-time, and this is the first time that we saw the air sensor, it has three levels, good, marginal, and … Four levels, bad and really bad. Inside of our home, before we turn the air purifiers on, it was really bad, and so this is an example, we had our doors closed, our windows closed, and yet the outside environment was coming inside of our home, and I think this is one thing that’s really important for everybody to understand, that what’s happening outside of your home is also coming inside. You mentioned that you live in this valley that has high levels of particulate pollutants, and now you want to move away from that, and I think that’s a good choice, but not all of us have the freedom in our lives to be able to make that kind of healthy choice. There’s some pretty scary research that’s been coming up about this outdoor air pollution that can get within our homes, and if you don’t mind I’d just like to touch on something that I think is important. Robyn: Yeah. I would love for you to touch on the other reasons besides the fact that some of the outdoor air comes inside, and, like you said, not everybody can up and move to a higher elevation, but what’s sad is, I’m gonna move up to Park City where the air is clean, but all four of my kids will still be down here in the valleys going to college and working, and so I still … it’s still very much on my mind even when I leave. Talk about what else is going on inside our indoor air, or is that what you were gonna talk about? Peter: I just wanted to mention one thing that all your listeners should be aware of, which is how close they live near a highway or freeway. It turns out in the city of Los Angeles, over two and a half million people live … This is just in the city of Los Angeles, within a thousand feet of a freeway. It turns out … this really increases the incidence of strokes, heart attack, lung cancer, COPD, pre-term births, childhood obesity, autism, and almost a 10% higher chance of dementia. This phenomenon of building along freeways … This is people living inside their homes near a freeway within a thousand feet. If any of your listeners fall into that category, that alone means that they should have an air purifier in all the rooms that they spend any significant amount of time in. I just wanted to mention that … point. Then, similarly, with all the environmental … hazards that we’ve had recently, all these natural disasters, then that is compounding the problem for anybody who lives near any of, let’s say, these wildfires. There’s a new study from the Georgia Institute of Technology that revealed that wildfires releases a toxic brew of pollution that are a hazard to human health, particularly the lungs and the heart. Then, in Houston, where we recently had this hurricane, 10,000 pounds of volatile organic chemicals were released when chemical plants were flooded, and the air monitors in those homes nearby, showed that in the homes themselves, that people were exposed to a level of benzine that you would normally need chemical breathing apparatus. We’re living in a time of uncertainty, and the problem is, when these environmental disasters happen, you don’t find out until it’s too late, until you’ve already been exposed to those chemicals. I’m a big believer in prevention, and so to always be safe against these very serious problems, it’s always good to have an air purifier in your home. Now, we’ll get to the more day-to-day contaminants that are in a home when these special situations aren’t occurring, and I think it’s often very surprising to people when they learn that our own environmental protection agency says right on their website that, “Indoor air can be up to 100 times more polluted than outdoor air,” and how can that be? In addition to the contaminants that are coming from outside that I was just talking about, some of the more common ways that we get indoor air pollution is from cleaning products. We might have mold or dampness in our homes. Air fresheners are one of the largest causes of indoor air pollution, the perfumes and deodorants that we use with synthetic fragrances and other chemical compounds. If we have gas stoves or ovens, or dryers, if we burn candles, or enjoy natural fire, simply burning food, if we use non-stick cookware. If we have pets and pet dander, if we use insect control chemicals, if anybody in the family smokes, and then there are termites, and cockroaches, and dust mites, and their droppings. Then building materials: wallboard, carpeting, house paint, furniture. All of these things are creating a toxic environment in our home and, actually the more homes are sealed, and the more we keep our doors and windows closed to keep the outside pollutants out, then the more we trap these internal chemicals inside of our home. Robyn: Okay. We have literally a hundred things that are putting out pollution, and a lot of them are things we’re doing ourselves, with the nail polish, and the hairspray, and the cleaning stuff that we spray inside our shower, and then we go in there and then the most sensitive tissues of our respiratory system are inhaling those chemicals. You have invented a product. The reason I’m so excited about it, is that its small, it’s really quiet, and we have worked out a deal with your company where Green Smoothie Girl readers can get 50% off. I wanted a bunch of them, but you can actually get the 50% off even if you’re getting just one. I have three of them in my 4,500 square foot home, and I would love for you to talk a little bit about it. It’s a $599 unit that we are able to get for you at $299. You can find this deal at greensmoothiegirl.com/airdoctor. And, Peter, I wonder if you can talk to us about what’s special about your air purifier? I love that I don’t have to put it on the whole house, the source. I love that I can put it in the places in my house where I spend the most time, or I think are the dirtiest. I can move it around if I want. I love that I’m gonna be able to take them with me to Park City, and I didn’t even know that, what you just taught us, my new home in Park City is like three blocks off the freeway, whereas right now I’m like a mile and a half off the freeway, so uh-huh, well, at least I’ve got my Air Doctor units, but why did you invent this, and what’s special about the Air Doctor? Peter: Sure. Thank you for asking. When most people think of air purifiers they think of an air purifier that they might buy at one of our discount retailers, let’s say Wal-Mart or Target, or Costco, and the … those air purifiers that somebody buys for $100, or $200, they’re actually, one, they’re usually too small to really do an effective job on a large room. Also, they’re also only designed to remove particles from the air: dust, smoke, and pollen, but they’re not trapping any of these chemical contaminants that we were just talking about that come from all those wide variety of products. Like, you mentioned nail polish, and I mentioned perfume, and cleaning products. Those chemicals, which we call volatile organic chemicals, are actually some of the most hazardous chemicals to our health. A filter, like in a regular air purifier, will only remove the particles and it leaves all these contaminants in a gas-state. We have both a filter, which is called a HEPA filter, which is a particle filter, and we also have a filter that we call a gas trap, or volatile organic chemical filter that removes all the chemicals from the air. Sometimes you’ll see an air filter and it says that it removes odors, or it removes chemicals, and then when you look at it inside it’s … there’s a filter that’s about the thickness of a few pieces of paper with a little bit of carbon impregnated on it, and that’s really not going to do anything. When you open up an Air Doctor you’ll see that there’s a large air filter that’s just filled with activated carbon, and also other special minerals that actually trap formaldehyde. Formaldehyde is an extremely dangerous cancer-causing gas that is found in almost all building materials: plywood, particle board, carpeting, wallboard; if you buy furniture, it’s in the furniture. You really want to make sure that your air purifier can remove that. Another feature of Air Doctor that’s very unique is the system is completely sealed. What I mean by that is, if you have an air purifier and the filter fits loosely into that air purifier, then the air is gonna take the path of least resistance, and it’s just gonna go around the filter and back out into your room. Air Doctor has a seal, and none of the air that’s passing through it can escape back into the room. I mentioned earlier that Air Doctor has an air sensor, and it actually will tell you what the quality of the air in your house is, and when you turn on Air Doctor you can simply put it in the auto mode and it will sense what’s going on in its environment, and so you can just really set it and forget it. Sometimes you’ll hear it go into a medium speed, or a high speed, and go back into a low speed, because, you at home don’t know, “Should I be running it at low, or medium, or high?,” so Air Doctor takes all the guesswork out of clean air. Then, your filter isn’t going to be helping you if it’s time to change the filter and you don’t change it, so Air Doctor has an air filter change alert, both for the carbon filter, and the HEPA filter. One other feature is that Air Doctor uses a very expensive type of motor and fan so it operates really quietly, and then the lower speeds you barely even know that it’s on. Robyn: Yeah, I have to walk past mine to notice that it’s on. It is very quiet, I was really surprised. How many times in an hour does the unit cycle through all the air in the … 900 square feet, right? Peter: Well, we can give you the measurements for different size rooms. Let’s say you have a large bedroom, a 450 square foot room. It will circulate all the air in that room six times an hour. In a 900 square foot room, which could be a large common area, or a living room, it sounds like you have a very large house, it will circulate the air in a 900 square foot room three times an hour, and it will circulate all the air in a 2,600 foot room once an hour. Robyn: Okay, yeah. I have one in my basement where my son sort of lives, and one in my master bedroom suite, which is huge, and then one in the living area. So, my office, and my living room, and my kitchen. That’s just how I have it. How you might have it in your home would be maybe different, but how much … This is really why I wanted to have you on the show, and this is why I wanted to partner with you, because, at Green Smoothie Girl, we’re going on 11-years-old, and we’ve tried to help those who are following my work with a lot of different areas of their health, including their nutrition, including their emotional health, and a lot of different areas of living in a toxic world, and this is kind of like that last piece. The reason I wanted to work with you is because of this fact that I want you to share. How much of the particulate pollution, and how much of the chemical pollution does the Air Doctor unit remove? Peter: In terms of particulate matter, the gold standard in air purifier filters is something called HEPA, and if your listeners see that word HEPA they may not know what it means. It means a high efficiency particulate air purifier, and this HEPA filter, actually, was developed during the development actually of the atomic bomb, as a method of capturing radioactive particles – very, very small particles. HEPA filter has a standard, which it captures 99.97% of all of the particles down to .3 microns. Air Doctor has a filter that actually goes beyond the HEPA standard, it’s the ultimate technology, we call it ultra HEPA, and it captures 99.95% of all particles down to .003 microns, that’s 100 times smaller than the HEPA standard. Basically, Air Doctor will remove virtually 100% of all particles of any size from the air. That also includes: bacteria, and virus, dust, dust mites, allergens, pretty much everything you could throw against it. Peter: Oh, sorry. And, on the VOCs, the activated carbon in Air Doctor, it will remove virtually 100% of the volatile organic chemicals, and as I mentioned, formaldehyde, which is really, really difficult to capture, we’ve put special minerals in there, which also capture 100% of the formaldehyde. Robyn: Well, that’s really exciting. If we’re gonna be stuck living in this toxic world where there is over 80,000 chemicals approved for use in our air, our water, our food, there’s not a lot that we can do about it, so I love to be able to discover solutions like this, and not super expensive, you know? I was expecting … When I started researching this subject several years ago I was expecting that I would have to spend several thousand dollars to solve the problem, and my whole big house cost me less than a $1,000 to put three units in it. It makes it affordable to give my three adult children who live away from their own unit. They may have been less enthusiastic about that Christmas gift than any other gift that I’ve ever given them, but that’s okay. My parents always gave me really unsexy gifts for Christmas, as well, when I was an adult. At that point, I’m about them living independently, and as healthy as possible, now that I’m not the one providing their food. I’m really impressed with your technology. I was diving in, I watched your videos, I read all your flyers, I dug into all the research and statistics, as I was learning more about your product, and I saw that air purifiers have a CADR number on them. What does that mean, and what’s Air Doctor’s CADR? Peter: Yeah, sure. The air purifier business is just filled with acronyms. We have, not only HEPA that we just talked about, but we also have the CADR, which means clean air delivery rate. The clean air delivery rate was actually created by people in the air purifier industry and testing laboratories, so that … there could be an objective score to compare one air purifier to another’s ability to remove certain types of common particulate matter from the air. I mentioned those types before … the types of contaminants that are measured are smoke particles, and the reason smoke was chosen is that the smoke particles are very small particles, those are the … what’s known as the PM 2.5 particles, those are the particles that are smaller than 2.5 microns, the ultra-fine particles. Then, dust, which is a little bit of a larger particle, and pollen, which is, yet again, a larger particle. There are actually three different clean air delivery rate numbers, and our Air Doctor is 326 for smoke, 343 for dust, and 373 for pollen. These are very high numbers, and the reason that I decided to develop the Air Doctor is that air purifiers, that I would call professional quality air purifiers that can remove dust, smoke, and pollen, and these wide variety of volatile organic chemicals that we’ve spoken about before, up to now they’ve been very, very expensive, and as you mentioned, you can spend thousands of dollars for them. It just didn’t seem right that the only people who could get an air purifier that would really keep their home safe for themselves and their family, would be people who could afford a thousand, or $1,500 or $2,000. We wanted to make something that had all the high-end prestige features at an affordable price. Robyn: Well, thank you for this invention and for making it affordable for, not just the super wealthy. I’m really excited to finally have this health concern covered in my home. I read that … I believe you said that the World Health Organization has said it’s the number one threat to our health, and that indoor air pollution is literally killing several million people a year worldwide, so this has been really, really helpful. Thank you for the discount for our readers. It’s at greensmoothiegirl.com/airdoctor. What else do you do that’s been most powerful for you? Give us a couple of actionables of things that you do in your life that you recommend to everyone to live at higher frequencies. Peter: Well, it’s an honor to be asked that question, I take it very, very seriously. When I first was studying natural medicine over 30 years ago, the first thing that really struck me about a … something that people could do to really positively impact their lives, was doing something to think more positively. One of the things that certainly causes a low frequency toxic life is, if we don’t think properly. Are we angry, or are we happy? Are we being judgmental, or are we forgiving? I think a healthy lifestyle really begins with an introspection about how are we thinking, and learning to think in a more positive way. I’ve been very disciplined over the last 30 years to create the proper internal environment by managing my mind, and I would encourage everybody who’s listening to find the right way for themselves to have a more positive relationship with themselves, and their family, their friends, and their environment by improving the quality of their thoughts. Robyn: That is perfect, and I bet that you don’t have a positive mindset, and you haven’t cultivated that by everything going perfectly in your life. Am I right? Peter: We certainly can’t control what happens to us all the time, but we can manage how we react to it, and, like everybody else, I have my ups and downs, and situations that I had to deal with that I wish were otherwise. Robyn: Well, thank you so much for bringing your expertise as an expert on indoor air quality to our show today. Thank you so much, Peter Spiegel. Peter: All right. Thank you so much for your time, Robyn. I really appreciate it. Why do you not send to any where besides US and Canada? So many times we listen to programs and get excited because of what we learn only to find that unless you live in America you can’t benefit. The air filter is terrific and it’s so frustrating. Thank you very much for all the info from the recent seminar.